Very nice , i had one of those grass plants a few year ago dont know what happened to it. Thats a cracking shot Lily everything is in focus and really well composed. Thanks everybody, the border to the right is a bit bare as I lost a couple of tall shrubs over the winter. This makes the Pittosporum 'lollipop' look a bit prominent. Have planted a couple of new shrubs but you can't see them yet. The Pittosporum is an experiment, we were taking it out as it looked like the 'gherkin' in London but half way through decided to try keeping it as a tree. Pity we had already chopped off so many branches though! Still not sure if it's staying but it does look better than when we first did it. Clarice, the grass is not hardy and has to be replaced every year. Not cheap but they are lovely. lily can you not have it in pot and over winter them? I have tried Sandra for 2 winters. I always have them in pots and the first winter I kept one in an unheated shed/greenhouse but it died and last year I sneaked one indoors and kept it in the study but it still died, although more slowly! They are called Pennisetum Setaceum Rubrum or Purple Fountain Grass and no they are not sold as hardy. AndrewR overwintered his in his living room last year but I wouldn't be alllowed to do that! Tis a nice grass and effective sets off the rest and the corner section looks beautiful and nicely enclosed too. What a beautiful plant Lily. You are a photographer as well as a gardener. I've got the name of it now, only problem will be finding a space to put it ! Well, I've never been called a photographer before Sue, fuzzy shots are usually my speciality! Thanks to GoY I'm improving and getting to grips with what my camera can do given the chance. 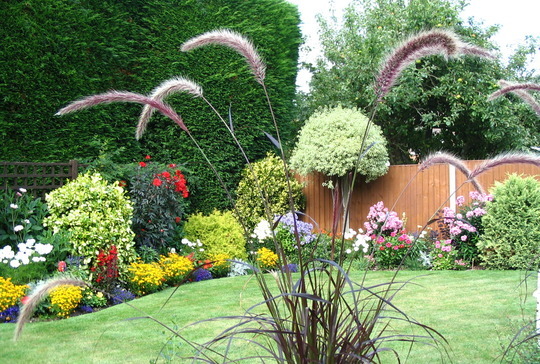 Another lovely photo of a very pretty garden and the Grass looks great in pride of place. I think it wouldn't look nearly as good in a border, it does need to be standing alone in the spotlight like that. Pennisetum 'Rubrum'!!!! I just learned this my fave grass isn't hardy in Massachusetts, USA! How unfair (to me)!.. It's a shame isn't it Tate. I have to buy them every year too. Thank you Duddyboy, it's great to look back at these old photos and remind myself of things to come again this year......not long now!